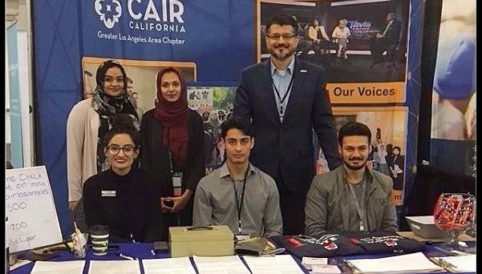 CAIR-LA staff and volunteers registered voters at the 20th Annual MAS Convention at the Ontario Convention Center. We collected over 400 pledges to vote in the 2018 elections and registered more than 60 people to vote. We are dedicated to increasing Muslim American voter turnout so that we as a community can leverage our civil rights for a brighter future. Asmaa Ahmed, our Policy and Advocacy Coordinator, and Masih Fouladi, our Advocacy Manager, led a session entitled, “Empowering the Ummah: Changing the World Through Political Engagement,” where they spoke about the importance of advocacy and civic engagement and discussed CAIR-LA’s Voter Registration Campaign. In addition, our Leadership Development Coordinator, Yusra Khafagi, presented on a panel entitled, “The Best Servants of Allah,” centered around youth activism. She discussed CAIR-LA’s youth programs including, the Muslim Game Changers Network, the Muslim Youth Leadership Program, and the Bridging Communities Program.